UAMS Chancellor Cam Patterson, M.D., MBA (left), and TRI Director Laura James, M.D. (far right), presented the award to the Rev. William H. Robinson, Deborah Bell and Arlene Williams. 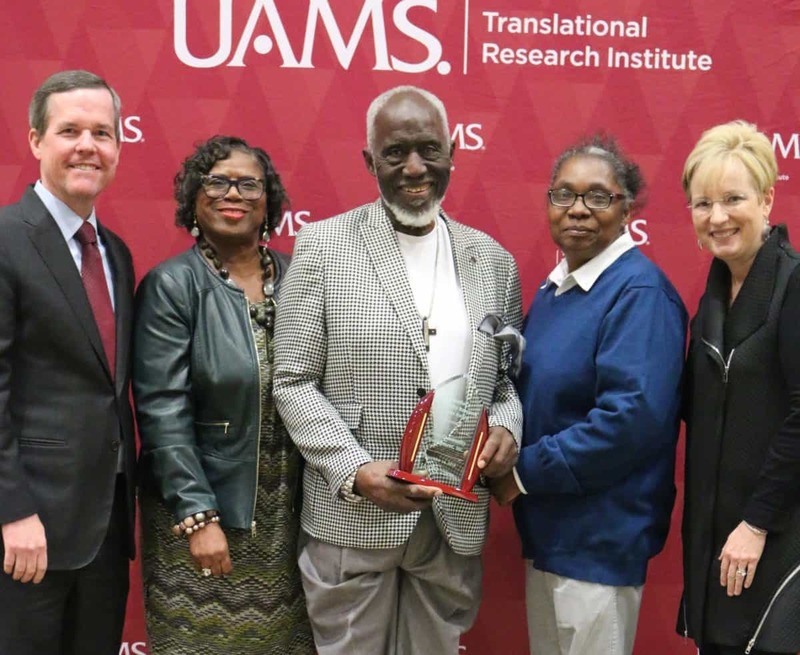 Nov. 26, 2018 | Better Community Development Inc. (BCD), which has a 25-year history of collaboration with UAMS, received the Chancellor’s Community Research Partner Award at the UAMS Translational Research Institute Community Partner Celebration. UAMS Chancellor Cam Patterson, M.D., MBA, and TRI Director Laura James, M.D., presented the award to the Rev. William H. Robinson, Deborah Bell and Arlene Williams during a Nov. 16 celebration dinner at The Centre at University Park in Little Rock. The Holman Heritage Community Center, formerly the Holman School serving African American students in Stuttgart until 1970, was restored by Calvin Criner and the school’s alumni to serve as an educational, civic, recreational, and business development resource for their community. For the past eight years, Criner, executive director of the Holman Heritage Community Center, has served as a community guide for UAMS College of Public Health doctoral students. Criner has demonstrated a commitment to bridging the racial divide in his community. By transparently sharing his extensive knowledge of the historical, geographic, and political landscape of his hometown, the students have learned how complex and deeply rooted the causes of health disparities can be. Members of the 12th Street Health and Wellness Center Community Advisory Board (CAB) represent various groups and interests of the midtown Little Rock area. The CAB has provided support for the clinic through advertisement of the clinic’s services, recommendation of services needed by the community, development of the first patient satisfaction survey, and volunteering at the night clinics. The CAB’s efforts have helped to make sure the clinic is no longer just another building in the community, but a valuable community asset. John Musser, a second-year medical student in the UAMS College of Medicine. His vision for Rural Ophthalmology Optometry Treatment and Screening (ROOTS), predates his first year of medical school. This nonprofit partners with eye doctors to help children receive vision treatment. His group has hosted several screenings beginning with an outreach in the Little Rock School District. They provided glasses at no cost to the students and set up follow-up care. Additionally, ROOTS hosted a summer camp to educate children about eye health. Musser has a passion for helping others and is making a difference in children’s lives. Benton County has provided invaluable opportunities to collaboratively develop trainings, interventions, and evidence-based practices for vulnerable populations. Without their support UAMS would not have been able to pilot interventions (such as HIV education and training) that are now statewide and have resulted in over $1 million in revenue for prevention and research. UAMS has worked with the Benton County Drug Court for over 13 years to enhance the treatment for substance abuse, co-occurring substance abuse and mental health, and wraparound health services offered through the drug court. Without Benton County’s strong collaboration, much of UAMS’ research and evaluation of the health needs of Arkansas’ most vulnerable residents would not have been possible. This award recognizes an outstanding community-based organization that has participated in health research. Previous winners are not eligible for nomination until three years has passed since they received this award. BCD has been serving high-risk, low-income Arkansans for 37 years. UAMS colleagues from the College of Public Health and College of Medicine, Department of Family and Preventive Medicine, have collaborated with BCD for 25 of those years. UAMS is now partnering with BCD in a three-year Substance Abuse and Mental Health Services Administration (SAMHSA)-funded project to decrease HIV and viral hepatitis (VH) transmission and improve health outcomes among 270 high-risk, low-income, adult African-American women in treatment for substance use disorder (SUD) in Pulaski County. The project is inserting HIV/VH education and testing and other evidence-based services as part of an existing women’s substance use disorder treatment program to increase client engagement and retention, knowledge and self-care behaviors to prevent HIV/VH and improve overall health and well-being.